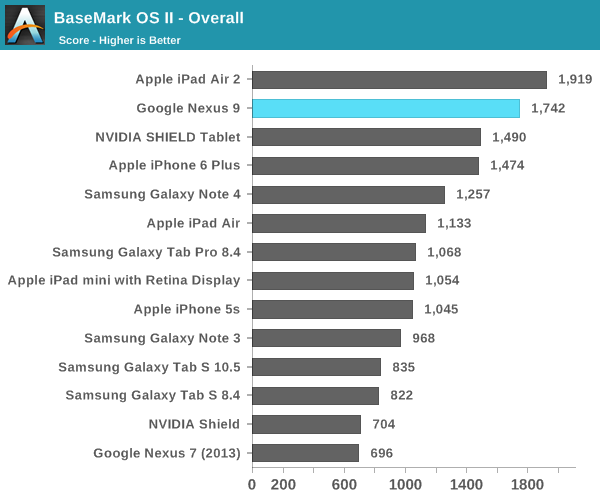 While there’s a great deal of ground to cover on the tablet as a whole, one of the most interesting aspects of the Nexus 9 is the SoC. While we’ve tested Tegra K1 before, we were looking at the more traditional Cortex A15 variant. The Denver variant (Tegra13x) is mostly similar to Tegra K1-32 (Tegra12x), but instead the CPU cores are a radically different design. 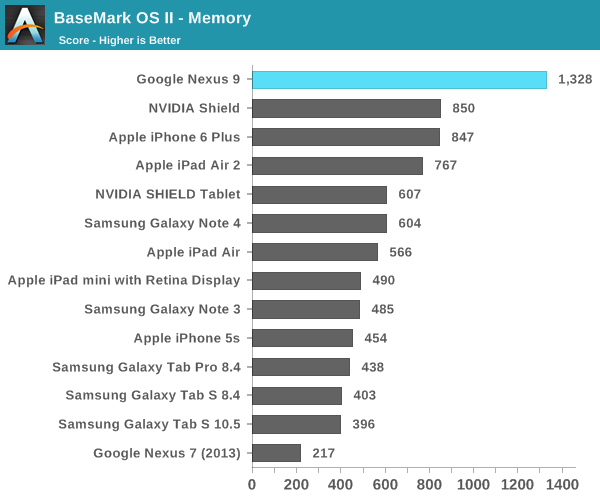 In order to get an idea for how this translates into real world we can look at a few of our standard benchmarks in this area, although Google Octane couldn’t complete a full run. 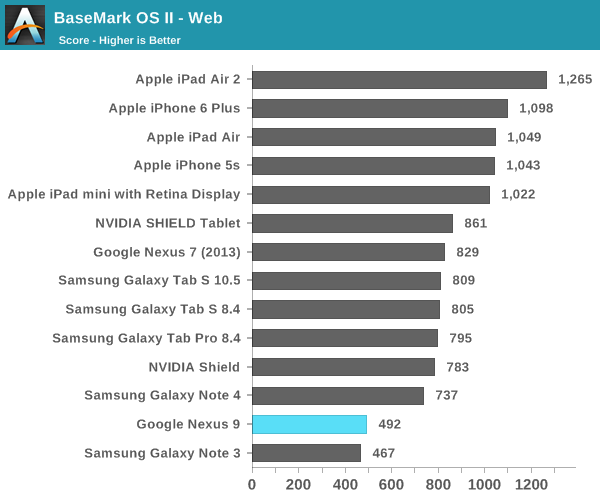 This build of Android clearly has AArch64 active, which means that we should be able to directly compare the Nexus 9 to the iPad Air 2 for performance. 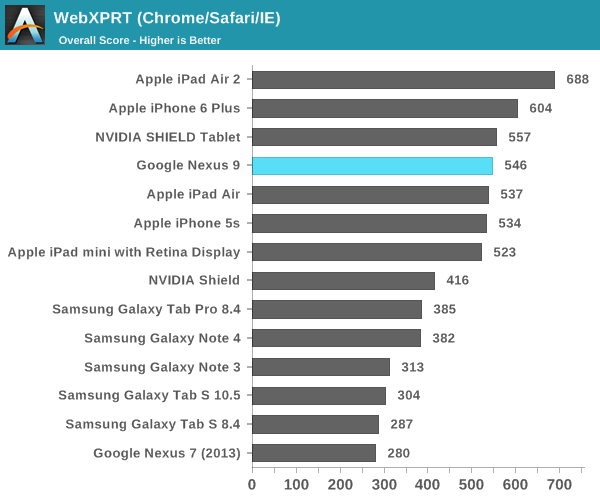 As one can see, at least at this stage in development the Nexus 9 can show some level of promise at times, but can be a bit disappointing in others. In SunSpider, Denver is generally even slower than Krait. 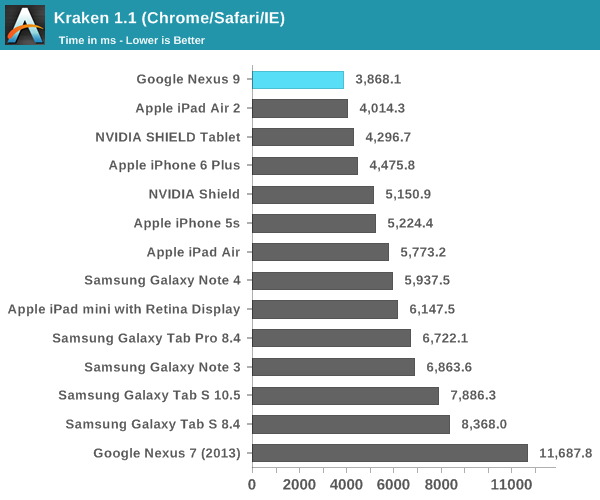 However, in a benchmark like Kraken the Nexus 9 easily pulls ahead to take the top spot. 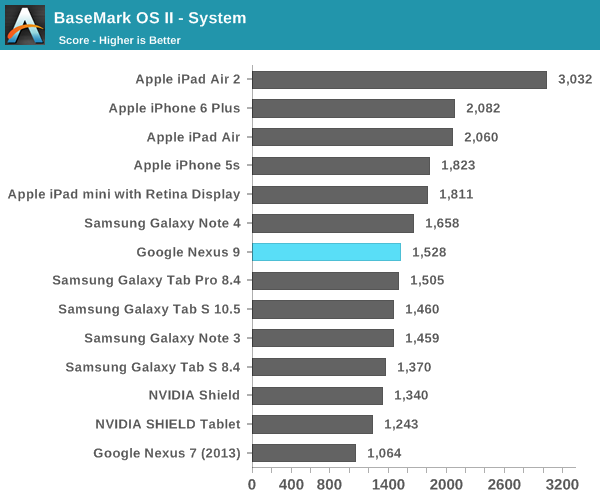 In Basemark OS II the Nexus 9 does well overall but this seems to be due to its graphics performance/GPU performance and storage performance rather than CPU-bound tests like the system and web tests. It seems that when the code morphing systems works as expected, Denver can deliver significant amounts of performance. However, when such code morphing falls flat its true performance with a dual core, 2.3 GHz configuration is around that of a four Krait core CPU system at similar clock speeds. Once again, it's important to emphasize that this build is far from complete so performance should improve across the board with launch software. 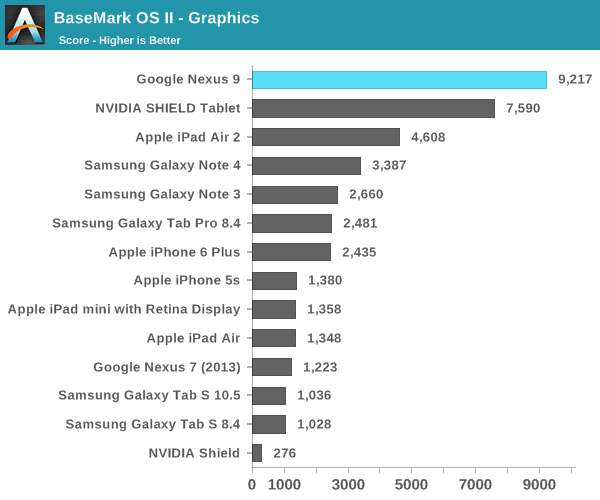 The fact that Tegra13x can approach A8X in CPU performance in some tests is definitely interesting to see. While Denver's performance is a bit mixed, it's worth taking a look at battery life to see how Denver performs in these areas. As always, our battery life tests are all run with the display calibrated to 200 nits. 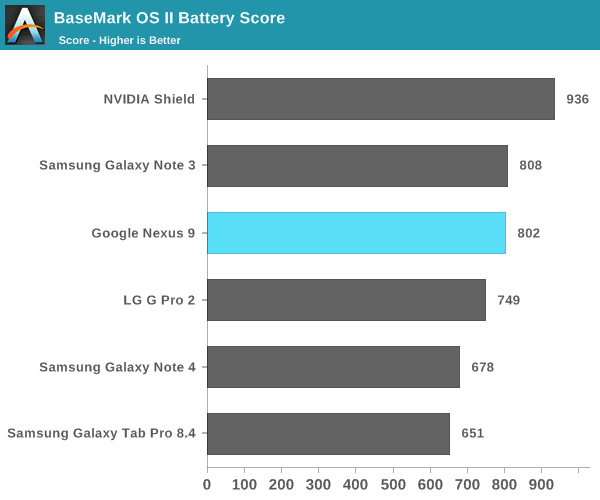 While an early build, it seems that the Nexus 9 is reasonably competitive in battery life but I'm not sure that these results are perfectly accurate. At any rate, efficiency at this stage seems to be par for the course, which should bode well for shipping software. 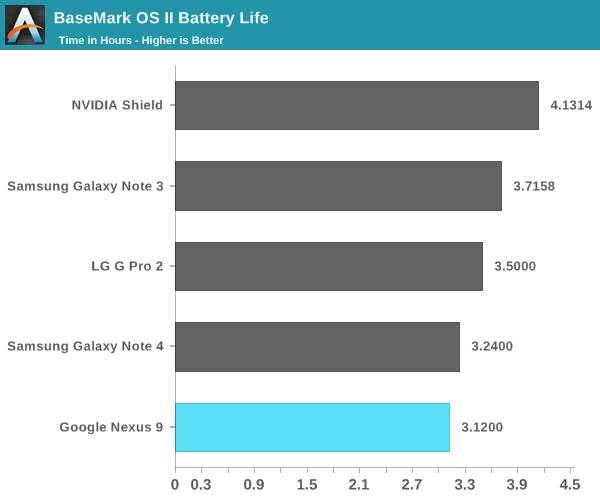 This is a mostly display-bound test though, so we'll look at Basemark OS II to get a better idea for compute-bound battery life. 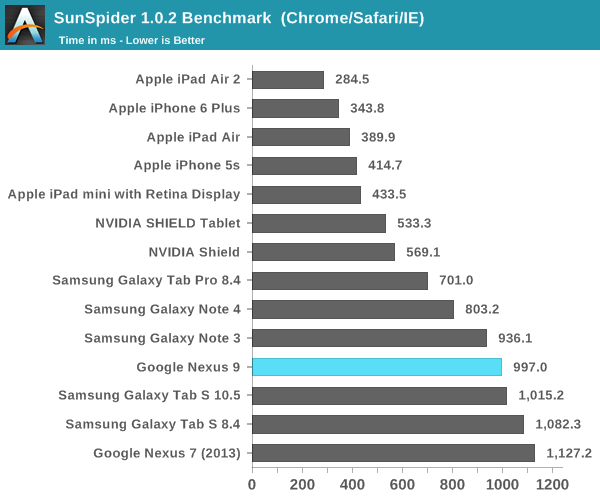 As one can see, while the battery life of the Nexus 9 ends up on the bottom for phablets and tablets, the overall performance during the test is quite high. We're working on a better comparison for the final review, but this should give a good idea of what to expect in general. Yep, but keep in mind Apple is leveraging 20nm and 1Bn extra transistors on their A8X, which almost perfectly translates into 50% more CPU (1 extra core from 2 in A8) and 50% more GPU (2 extra Rogue GPU clusters from 4 in A8). So the disparity in CPU perf is easy to explain in any case. I think the Denver K1 did better than expected given early benchmarks had it losing to A8X virtually across the board (except for single-threaded). 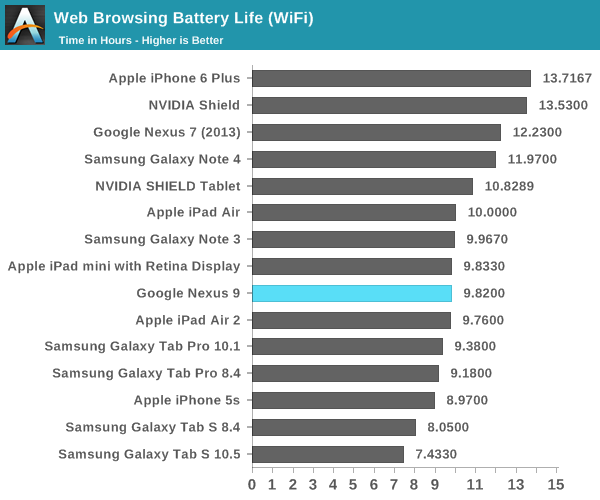 According to ZD the iPad Air 2's battery is 27.62Wh (actually smaller than iPad Air) while the Nexus 9's battery is 25.46Wh, so yeah while the Air has the bigger screen, it also has the bigger battery and benefit of 20nm on its SoC.